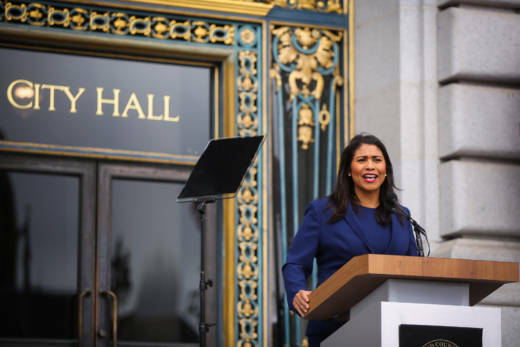 Mayor-elect London Breed practices her speech outside City Hall ahead of the Mayoral inauguration in San Francisco, California, on Wednesday, July 11, 2018. San Francisco Mayor London Breed took some time recently to chat with KQED's Guy Marzorati about her first 100 days in office and what she's done so far to address the city's ongoing homeless and housing challenges. Marzorati: You successfully pushed for a bill at the state level that will expand the conservatorship program here in S.F. and allow the county to take responsibility for homeless residents who have severe mental health issues. That state law goes into effect in January. Are you confident the city will have a plan in place to deal with those folks by then and also residential treatment beds available at that time? Breed: I am more than confident, and I’m excited about what we are planning in order to address this major challenge. This is a huge victory for our city, and right now we’re developing the legislation to send to the Board of Supervisors to opt into this particular program. The other part of that is we’ve identified locations to increase the number of mental health stabilization beds in S.F. to meet what we expect to be the need so that they have places to go. We can’t “conserve” anyone unless we have a place for them to go. And that’s what this is about. Because people are frustrated when they see someone who clearly needs help, who is clearly having, unfortunately, a mental breakdown, and jail is not the place for them to be when they need to get better. It’s really about getting them into the right place, into a treatment facility for the purposes of developing a long-term plan of action to help them get stable, to help them get housed, to help them get the services they need in order to be in a better situation than what we see. Marzorati: Voters in November are going to vote on Proposition C in the city to bring in more revenue for homeless services. You oppose that measure. If that’s not the answer, do you and your administration have an alternate plan to bring in new revenues to address this crisis? Breed: I think what's important with what we do with the over $300 million that we are spending for homeless services, including an additional $60 million that I have been able to add to the budget this past fiscal year, is that there is a level of accountability. We use a lot of the money to pay for subsidies to house people. There’s a lot of the money, of course, that’s used for supportive services. And right now we have just started this process I’m really excited about where we have a coordinated entry system for people who are struggling with homelessness in order to get them the help and support they need. The goal to use this system is to follow people, to understand what the challenges are, and to make sure that we’re able to track the resources that are being used and how we’re able to help someone. From my perspective, we need to understand what we’re doing now, whether or not we’re making the right investments and, more importantly, what is our long-term plan of action to address these issues. This is a problem bigger than just San Francisco. We have to look at regional strategies, we have to look at what we are doing now and the investments we’re making now, redirecting those funds. Can big business pay more to support this? Yes, they can. But things like a ballot measure need to be handled more responsibly, where you’re bringing everyone to the table for the purposes of providing input and looking at the financial data, looking at jobs, looking at all of those things and how they play a role in making sure that as we try and tax, that there aren’t the unintended consequences of job loss for middle-income residents. I mean, manufacturing, retail, those are things that are important to San Francisco. And people keep talking about this gap between the haves and the haves-not. Well, yeah, the haves on the whole top level can definitely afford to pay a lot more. But I want to make sure as mayor, because I have to be the one to implement anything that is taxed or the voters initiate, I want to make sure that I can promise that this will deliver the results they’re looking for. And at this time, that's where we're struggling with the challenges of Prop C.
Marzorati: That goes right into my next question. Is it a concern of yours that ultimately you’re going to have to be the one accountable for the spending as it relates to the homeless crisis? Breed: Yeah, and I think that people elected me in order to address this problem. This is at the top of everyone’s list because it is a problem in San Francisco. But I think in order to address it, we have to understand it better. We have to understand where our resources are already going, and we have to make better investments now. So that’s what I’m trying to do as mayor. Before I ask for another commitment, I want to make sure that as I’m being held accountable, it’s for the decisions I make, not the decisions that other people are making. Marzorati: You talk about getting a greater understanding of the current homeless population and how they're being served in the city. Do you think the city and homeless advocates should hold off on any new funding before the city gets a greater account of that? Breed: Any increase in taxes ought to be a collaborative effort. There ought to be real options for the purposes of making sure that when we ask the voters for this money, that we’re able to deliver what we say we’re going to deliver as a result of this money. Marzorati: I want to ask about safe injection sites. This was another bill at the state level that was vetoed by the governor that would have allowed pilot program for supervised injection sites here in the city. You said you’re not giving up on it. What does that mean? Breed: We’re looking at ways in which we could potentially open a site or sites here in our city. In addition to the challenges with state law, there are challenges with federal law as well. We are hopeful that Gavin Newsom, if he becomes governor, will be more supportive of our efforts, because this is just not about providing a convenient place for people to shoot-up and use drugs. People unfortunately suffer from drug addiction, and it’s not just going to go away because we don’t want to see it. So what are ways in which we can try to help people into treatment? This is one of the most effective ways to do that. And this is why I’m pushing for it, because when that person is coming to a safe injection site on a regular basis, we’re able to collect and discard the needles safely, we’re able to keep it in contained environment so it’s not happening out on the streets, and you don’t see the needles out there as much. It could not only save lives, it could save money. It could save about $2.3 million in the hospital visits, the needle cleanup, all these things we’re dealing with around public health. This is just an innovative way to address what we know is a very challenging, complex problem. The opioid crisis sadly has impacted not just San Francisco, but it exists all over the United States. We have to do something different if we want to see something different. Marzorati: You talked during the campaign about a “historic culture of no” in San Francisco around the development of housing. Can you talk about your administration’s efforts around streamlining and getting housing built faster that has already been identified as affordable housing? Breed: One of the first things I did was to get all of the departments responsible for approvals as it relates to housing production and infrastructure together, and we meet on a regular basis to talk about solutions. And one of the easiest solutions that was proposed was to cut back on the bureaucratic red tape for ADUs — accessory dwelling units, aka in-laws. We came together, and I put out the directive to say that I want existing permits that are in the pipeline to be completed in the next six months. And moving forward, any new applications need to be approved within four months, because they were taking anywhere between 12 and 18 months. We’re talking about around 1,400 units, about 90 percent of those would most likely be rent-controlled units. This is the only way that we could add rent-controlled units into our housing stock. And we would hold it up with bureaucracy? Which is why I’m bringing on someone to manage this whole process for the purposes of making sure that we get rid of redundant policies, that departments are working together instead of in isolation, that we’re getting approvals faster for some of the minor things that hold up projects. We’re going to take care of this so we can get this much needed housing on the market now. Marzorati: When you take walks through neighborhoods, do you feel more optimistic or less optimistic as you sit here 100 days in, to solving this homeless crisis? Breed: I’m not yet satisfied, but I’m a lot more happy today than I was when I first started. Because I spend so much time in those neighborhoods where there are challenges. And what I appreciate most is that I am starting to see the difference, especially along Market Street. Now, to be clear, I’m not suggesting that we solved the problem. But compared to when I first started, the trash, the number of homeless individuals, just recently cracking down on drug dealing and a number of other issues. I just feel like people really feel excited. And they want their circumstances to change, of course, but we have to do a better job of helping them, and if they’re noticing a difference out there too, even though many of them are struggling, then I do think there’s hope for the future of San Francisco.